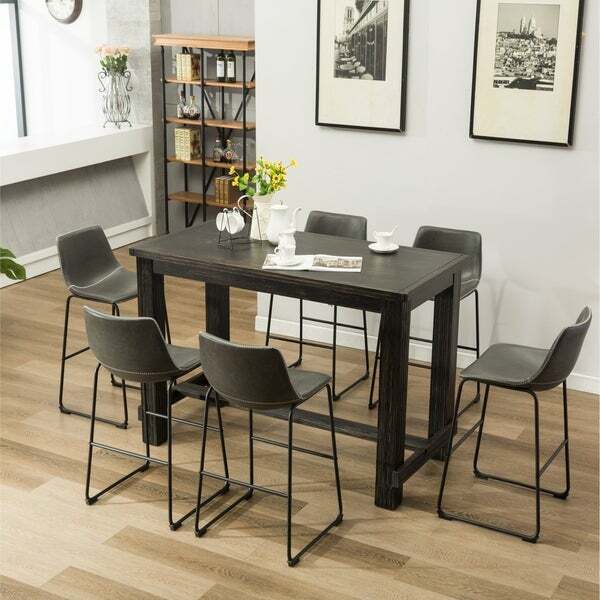 Inspired by the sheer simplicity and weatherworn beauty of primitive furniture, Lotusville 7-Piece Antique Black Finish Bar Height Wood Dining Table with 6 Faux Leather Chairs Set brings a relaxed sense of style into your space. It provides seating for up to 6 people, making it a versatile option that can accommodate both your family and guests. Enjoy cozy, intimate dinners and gatherings around the Lotusville Dining Table. The Lotusville Dining Chairs offers a sculpted seat/ back design and is upholstered in soft smooth PU with black metal frame. This style is available in dining height, counter height and bar height in Lotusville collection. This set includes 1 bar table and 6 bar stools. Table is made with select veneer and solids in a dry vintage weathered black finish. Chic and contemporary style, sleek rectangular shape with foot rest. Stools feature vintage PU Leather in your choice of color and durable metal frame in black finish, matching with the detailed zig-zag stitches. Dimensions 38.0 In. X 64.0 In. X 42.0 In.